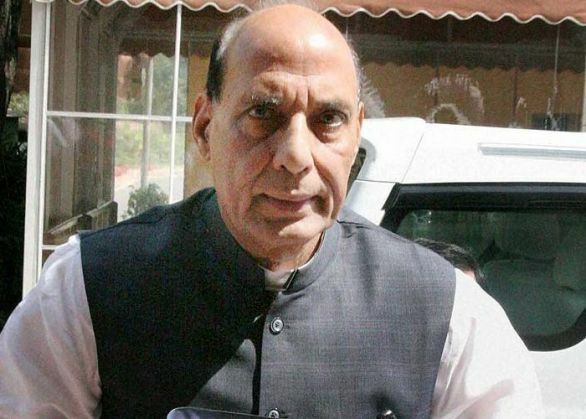 Home Minister Rajnath Singh today kicked off his six-day visit to China with a visit to the control room of the Public Security University here and discussed issues concerning training in security related matters. Singh, who arrived last night, met Fan Jingyu, the ruling Communist Party of China's Secretary of the University unit and discussed issues relating to training of the police officers, official source said. He is due to call on Premier Li Keqiang later today and hold talks with China's Public Security Minister Guo Shengkun, who is also the State Councillor in the CPC, a rank above the Minister. Guo will host a banquet in honour of Singh. Singh is the first Indian Home Minister to visit China in a decade. Shivraj Patil was the last Home Minister who had visited China in 2005. His visit comes in the backdrop of steady improvement of relations between the two countries while streamlining mechanisms to address the vexed border dispute. Singh will travel to Shanghai on Saturday where he will meet top CPC and security officials and address a meeting of the Indian Association of Shanghai. Reporting on Singh's visit, state-run Global Times today said that India has asked China to share its strategy in dealing with "jihad activities" in Northwest China's Xinjiang Uyghur Autonomous Region. China blames East Turkistan Islamic Movement (ETIM), an al-Qaeda backed outfit which has bases in Pakistan for carrying out violent attacks in Xinjiang and other parts of China. Pakistan's military recently carried out operations in the tribal areas targeting ETIM bases. "Separatists in Xinjiang, bordering Pakistan-occupied Kashmir, are believed by the Indian government to have certain links with terrorists in Kashmir," Jiang Jingkui, director of the Department of South Asian Languages at Peking University, told the daily. "In turn, the Indian government, which has gathered considerable intelligence in Pakistan, may also provide terrorism-related intelligence in Xinjiang to China," Sun Shihai, vice director of the Institute of Asia-Pacific Studies of the Chinese Academy of Social Sciences, told the daily. India is experiencing greater pressure than China in countering terrorism following several deadly attacks, Wang Dehua, director of the Institute for Southern and Central Asian Studies at the Shanghai Municipal Centre for International Studies, told the Global Times. "The Indian government led by the Bharatiya Janata Party, which deeply believes that Hinduism should be the major religion across the country, is more challenged by extremism and terrorism than its predecessor," Jiang said. "Besides, the Indian government is worried that the Islamic State (IS) may open a branch in the country, posing another threat to its anti-terror work," Wang said.